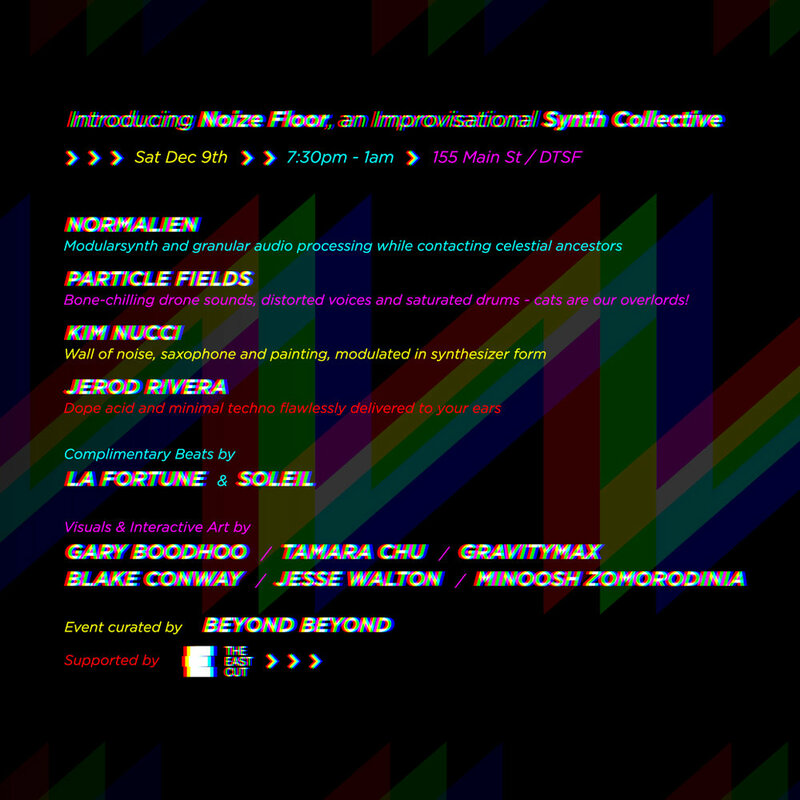 Introducing Noize Floor, a collective of electronic musicians specializing in modular synthesis and focused on developing their art form in a live, improvisational setting. For this launch event we're partnering with Beyond Beyond, an art collective that invades empty spaces downtown and curates pop up exhibitions. They are inviting video and film artists to animate the space. It's going to be fun! This alien is so basic. But he had one great idea: one day it dawned on him that you can actually make real music with a modular synthesizer and he's been contacting celestial ancestors via quantized frequencies ever since. Experimenter of modular synth sonic environments. Contrast of elements & methods, enriched by modulation & punctuated by glitch interferences, distorted voices, bone-chilling drones and saturated drums - cats are our overlords! Oakland-based multimedia artist/composer and improviser. She plays woodwinds and various homemade circuit and acoustic instruments. Pope of facebook. Worships dollar slice pizza as the one true god, while living in the god(pizza)less land of California. Combining videogames & machine learning to create science fiction cave paintings.